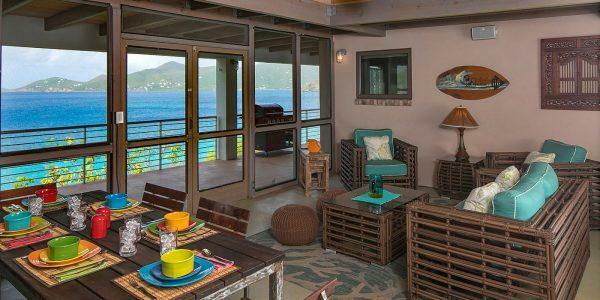 BEACHFRONT, Pet-Friendly, 3 Bedroom, Pool and snorkel from your doorstep! 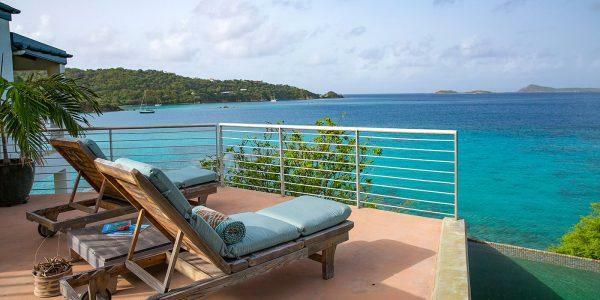 Perched overlooking white sand beaches and coral reefs in Lime Tree Bay, East of Eden St. John offers stunning views to the east, south and western sides of the island. 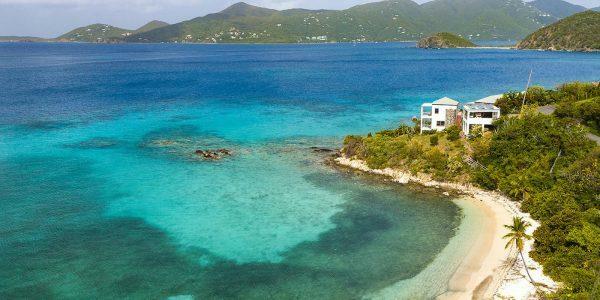 Lime Tree Bay is part of Hansen Bay and Round Bay on the quiet East End of St. John. 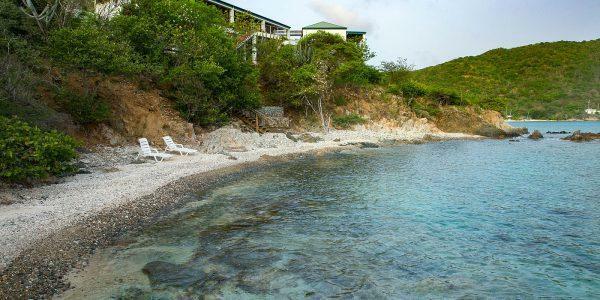 A one-minute walk (75 steps) down a stone pathway and wooden stairs brings you right to a white sand beach (locally known as “Vie’s”) that features colorful coral reefs just yards away. 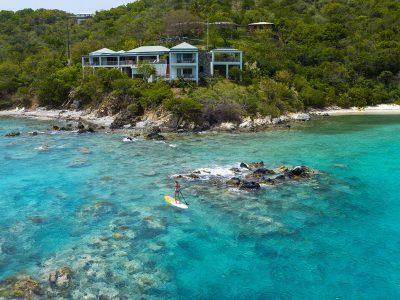 Tucked behind the sea grapes here are kayaks and stand up paddleboards that will allow you to explore Round Bay, Haulover and Coral Bay–without having to lift any equipment on or off your rental vehicle. 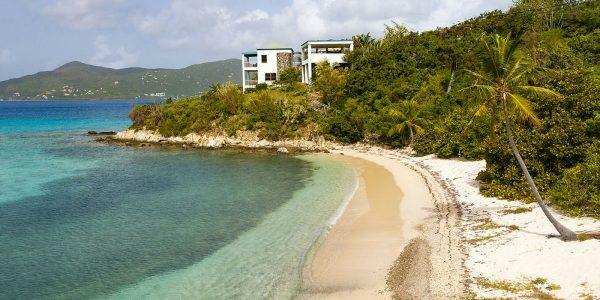 To the front of the villa is private access to a pebble beach that may or may not have a stretch of sand, depending on recent weather. 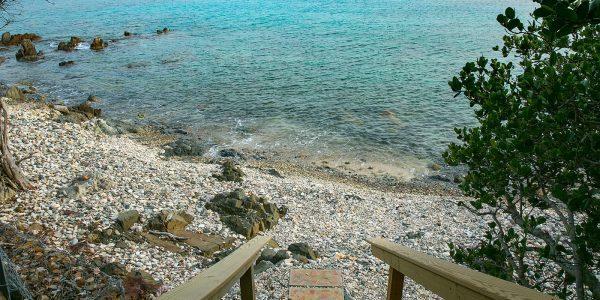 About 70 paces along a winding path and wooden stairway brings you directly to the beach. 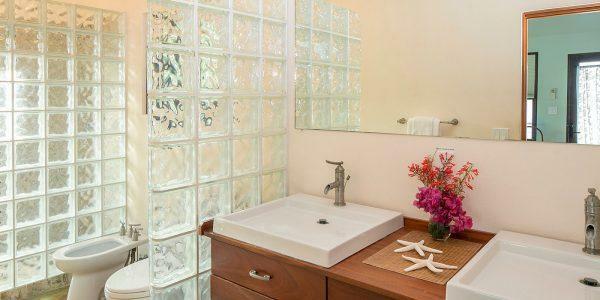 Sunbathe and relax in privacy while looking out to the south shore, or jump in the crystal clear water and begin a leisurely 20-minute snorkel to the south side of Haulover Bay, the closest National Park beach. If you prefer to walk, Haulover is just 10 minutes by foot. 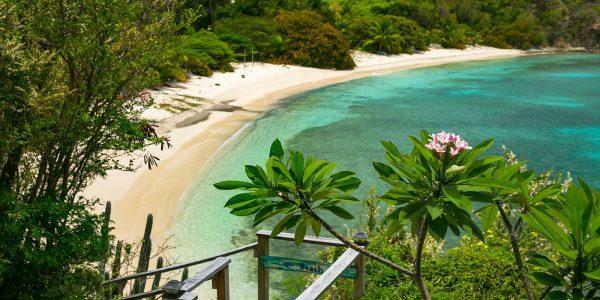 Round Bay and Haulover Bay are known to have some of the best snorkeling on St. John—and maybe in the Caribbean. 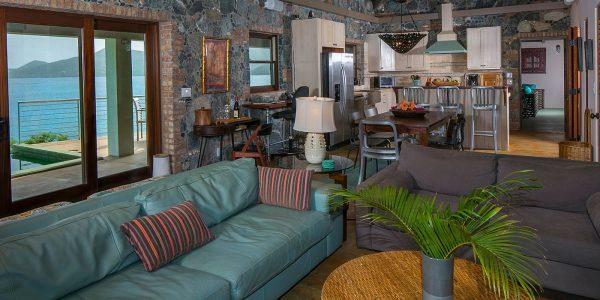 East of Eden is a stone and masonry house comprised of three “pods.” The main house features a great room with comfortable communal space for gathering and television viewing, a dining and desk area, and a modern, well-equipped kitchen. 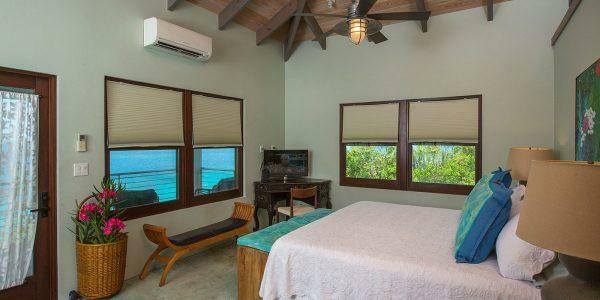 The large screened-in room separates the main house from one of the master bedrooms, providing additional dining space and comfortable lounging opportunities. 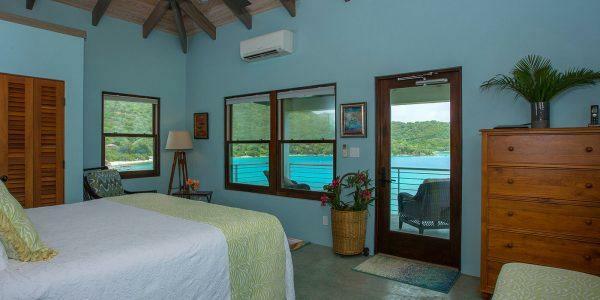 Every room has an unimpeded view of Coral Bay. 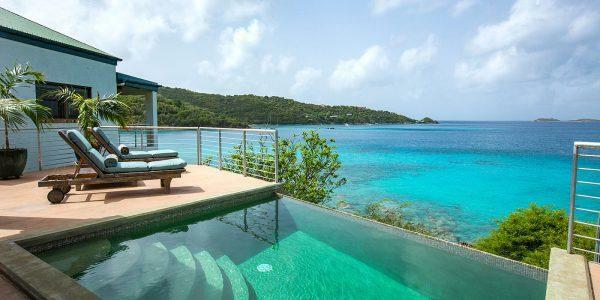 Outdoors on this level, you’ll also find an infinity-edge pool next to chaise lounges and a dining area. We think you’ll especially love the spectacular sunsets viewed from the pool. 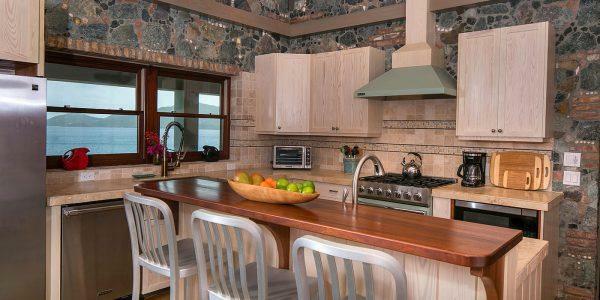 The gourmet kitchen features a 5-burner Viking range and dishwasher, side-by-side refrigerator with water and ice dispenser. Chat over cocktails at the mahogany-top island. 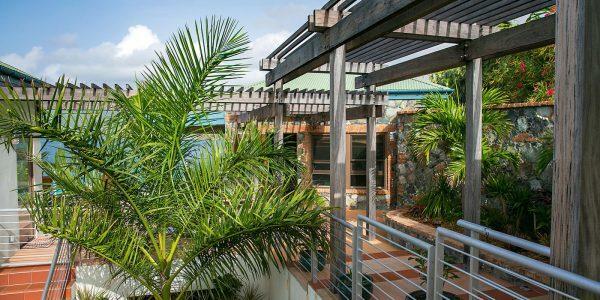 Dine indoors at the six-person table, al fresco on the deck, or have dinner in the screened-in room adjacent to the kitchen..
Three master bedrooms are equally spacious and private. 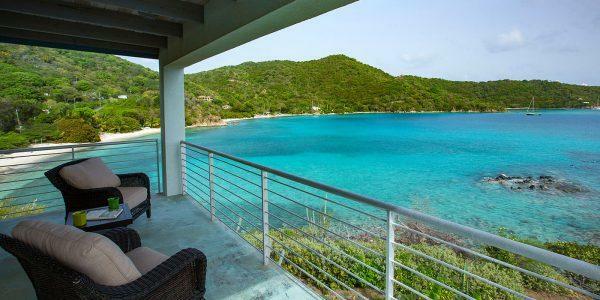 Each of the three bedroom suites has closets, balconies with outdoor seating, and private outdoor showers with an ocean view. One bedroom also features an indoor shower. 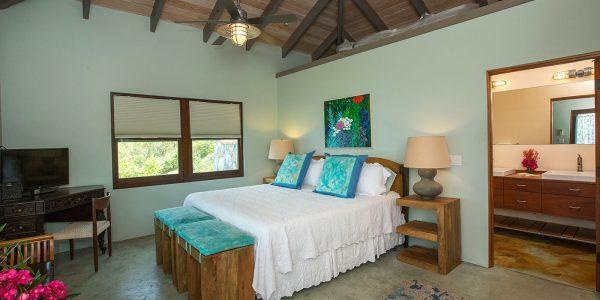 The bedrooms are furnished with king-sized beds, memory foam mattresses and ceiling fans. 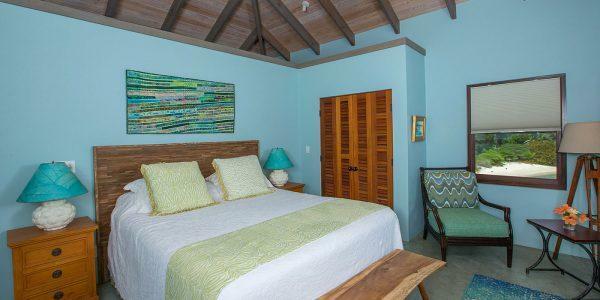 One of the bedrooms can be configured with two twin beds. 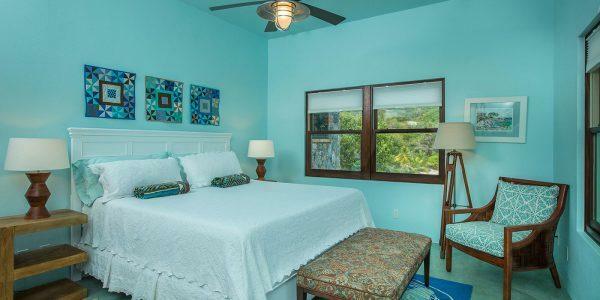 All have user-controlled air-conditioning units, but the nearly constant breezes are so wonderfully cooling, you may find that you do not use the A/C at all. 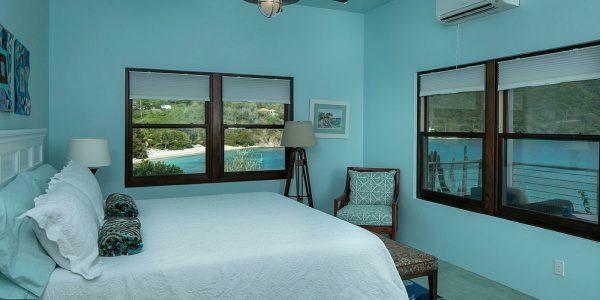 With your windows open, you’ll not only take full advantage of the breezes, but also drift to sleep and awaken to the sound of lapping waves. 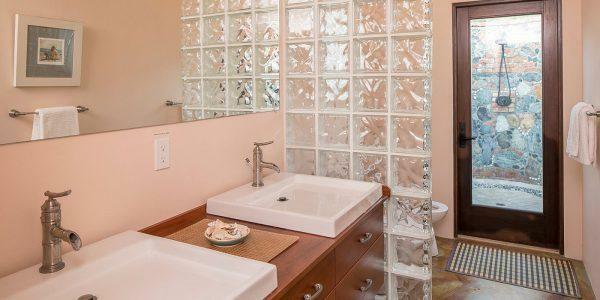 Each ensuite bathroom has two wading pool sinks, private toilet and bidet area, and an enclosed outdoor stone and masonry shower. Two of the bedrooms are steps away from the Great Room on the same level. One bedroom is located on a lower level. 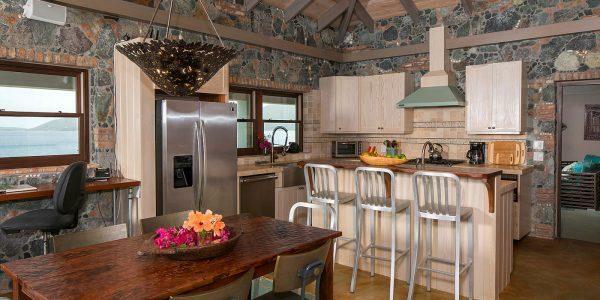 The home was designed to be energy efficient compliant. 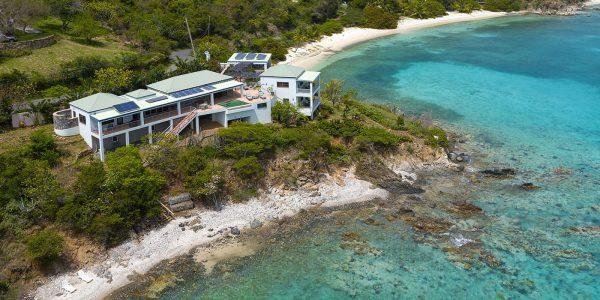 It employs a solar hot water system and solar panels for electricity. Peak Season. 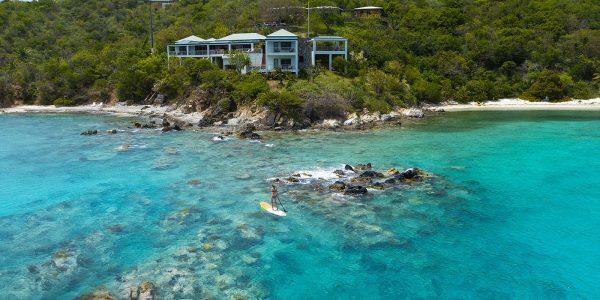 Minimum (7) nights, except in the event that we have un-booked nights between longer reservations. Christmas. Minimum (7) nights. Rate is $10,000 regardless of the number of guests (up to 6). New Year’s. Minimum (7) nights. Rate is $10,000 regardless of the number of guests (up to 6). Mid-Season. 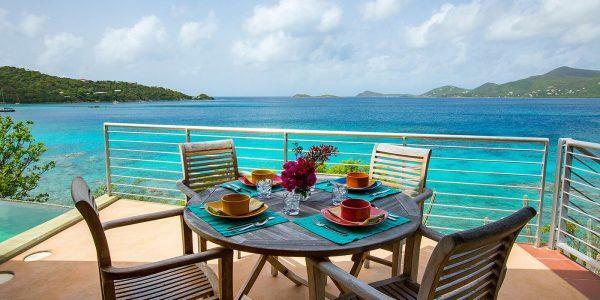 Minimum (7) nights, except in the event that we have un-booked nights between longer reservations. Low Season. 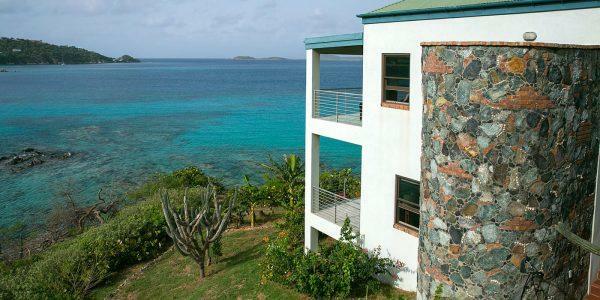 Minimum (5) nights, but we will accept (4) nights if there is space available and/or you are willing to pay a higher rate. We are taking reservations through April 2020. At this time, we are not using an online booking tool on our own website. 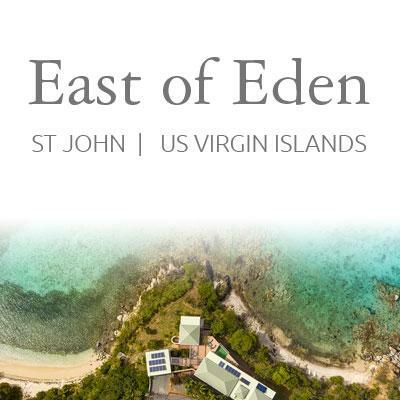 To make a direct reservation inquiry, please use the “Contact Us” form or send an email to: eastofedenstjohn@gmail.com. 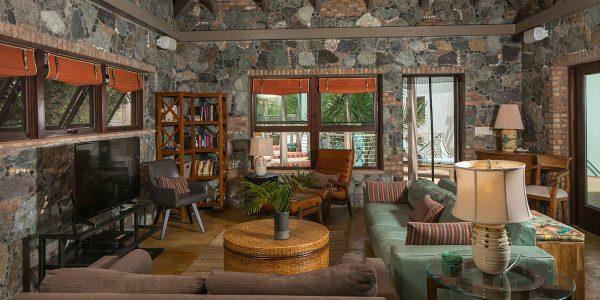 Indicate your preferred arrival and departure dates, the number of guests (including number of adults and children) and number of bedrooms required. We will reply within one business day with the rental rate and amount required for deposit. East of Eden is family-owned and managed. 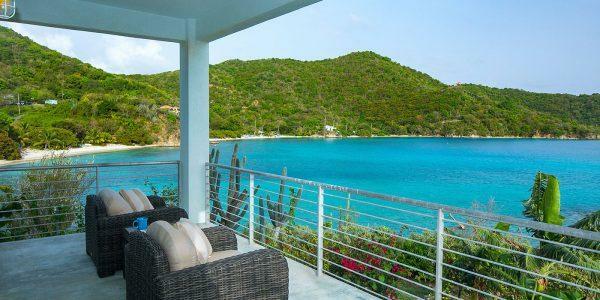 We will arrange to meet you upon your arrival in St. John, take you to your car rental agency to pick up your vehicle and guide you to the villa. More information will..